Devonport catches everybody’s attention with his beautiful black colour, noble look and extraordinary gaits. He made his performance test in Schlieckau and was awarded a 9 for rideability, character and willingness to work. 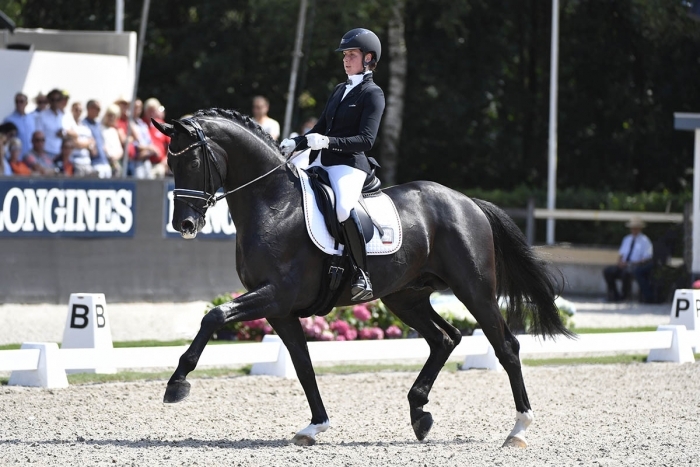 Later on he won the German Bundeschampionship for 4-year-old stallions and in 2018, he was a finalist at the world championship for young horses in Ermelo under Rieke Schnieder. Devonport is by the champion stallion, Dancier, who was the sovereign winner of his performance test in German Adelheidsdorf and won bronze at the German Bundeschampionship for 4-year-old stallions. Dancier had a very successful dressage career and was placed several times in S-level like many of his offspring. Dancier is by the well-known stallion, De Niro, who had a very successful dressage career with several victories in international Grand Prix but also sired several successful and talented stallions and sport horses. The grand sire is Ravallo, who won his 100-days test with an index of 155 points. Ravallo also sired the Grand Prix horses Riverdance and River Joy. Devonport is licensed in DWB, OLD, HANN, WESTPH, Süddt. Verbände, Mecklenburg, Rheinland. Devonport is stationed at Helgstrand Dressage.